Treatment Room : Part 2 | Design Ergonomics Inc. The following is a reprint of an article that was featured in “Dental Economics” July 2002 issue- entitled, “Ten Essential Elements of a Productive Treatment Room” Part 2 by Dr. David J. Ahearn. All rights reserved. Eliminate the nagging feeling that the operatory is cluttered. There are many functional possibilities for a successful design of an operatory. Before creating a physical layout, your first objective is to be able to recognize the difference between clear and concise and chaos and clutter. Bigger is not better. A treatment room overstuffed with low-use equipment is not the goal. Consider how you will use all three room dimensions as you decide upon the overall layout. 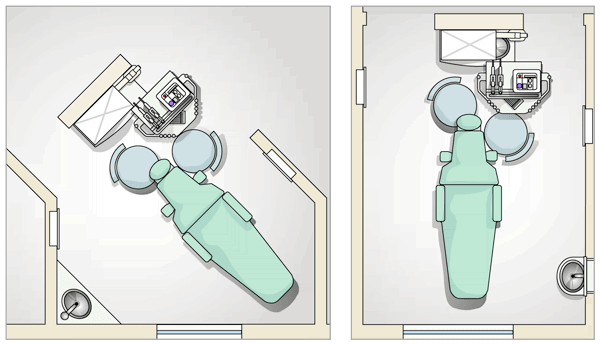 A compact plan is not only more efficient, it is also more easily worked into your office space, possibly even allowing for additional treatment rooms. (Figures 1A, 1B). FIGURES 1A, 1B: Two examples of compact, yet highly functional layouts. New technologies are a fact of life. They represent great opportunities. Yet, technology often is poorly utilized because the overall office system actually gets in the way of the new capability. Your operatory must make the deployment of new technology effortless. You must have clear egress for mobile units. Cable clutter cannot be tolerated, and bulky equipment should be avoided. You can’t always know what your future will include, but you can leave room for it. Balancing the need for privacy and access is never easy. A contemporary design must simultaneously respect the patient’s unequivocal desire for privacy while allowing the workers convenient access in and out of the treatment environment. Some offices are more willing than others to err on one side or the other of this equation. Some offices use cabinets as room dividers, which are acoustically and even visually porous. This method of division takes up needed space and costs more – don’t do it. Offices at the other extreme create treatment rooms with a single entrance door. These alternatives have merit in selected situations – a surgical suite, for example. A private operatory with dual access, though, allows freer range for both doctor and assistant. One type of treatment room often should be different (Figure 2). Contrary to popular wisdom, we will recommend that a general practice apportion 25 to 35 percent of their operatory space to dedicated, single-door hygiene rooms. This design can often be tightly integrated with the doctor rooms. (Figure 2). FIGURE 2: A doctor treatment room is adjacent to a hygiene treatment room. 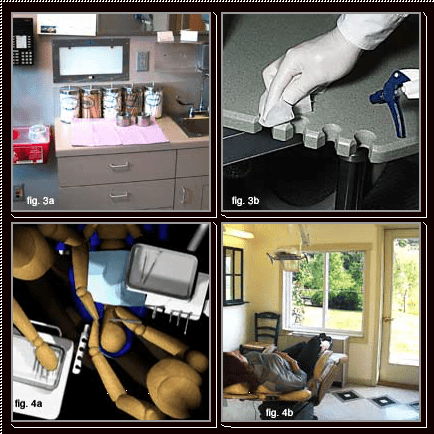 Now that you have designed a productive, ergonomically sound, easy to use, and compact treatment room, don’t forget the necessity to disinfect and reset rapidly. Avoid busy equipment with brackets and edges that are difficult to clean. Also avoid plans that make use of extensive cabinetry. Every item of equipment and cabinetry that you purchase is a potential source of contamination that must be permanently maintained. Given this fact, the cost of the equipment that you may have or will purchase for this room pales in comparison to the cost of its care and cleaning (Figures 3A, 3B). Consider this carefully. If you discover that cabinetry is difficult to maintain and is not essential to production, do not hesitate to rid your office of it. FIGURES 3A, 3B: This area (top, left) is cluttered, is not functional, and features hard-to-clean side cabinetry, as opposed to easily disinfected surfaces (top, right). 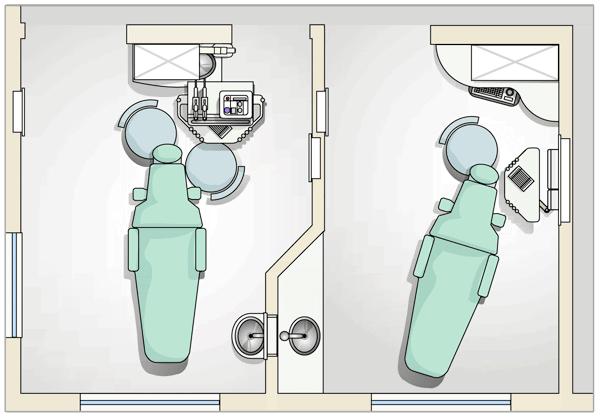 FIGURES 4A, 4B: Handpieces are thrust into the face of the patient in the illustration (bottom left), while the patient waits in a compact yet uncluttered environment (bottom right). Last, but certainly not least, please remember your patient. With so many ways to outfit an operatory, why choose a layout that places drills and pointy explorers in the patient’s face? Since the actual use of handpieces occurs during only 7 to 10 percent of a patient’s visit, you might consider this in the overall plan. What are your overall practice objectives? Referrals? Patients that choose elective treatment and volunteer for additional services? Relaxed patients? If those are primary objectives, then you must seriously consider slight modifications in your handpiece placement. If your office is a fee-for-service, independent practice, it is a small concession to make in order to realize your objectives (Figures 4A, 4B). In summary, the operatory is our place of refuge, the soul of the dental practice, and the engine of its productivity. Careful planning will allow you to exceed your expectations for the practice’s quality and productivity while enhancing the practitioners’ health and well-being. The plans do not need to be large or expensive in order to reward you with great success.